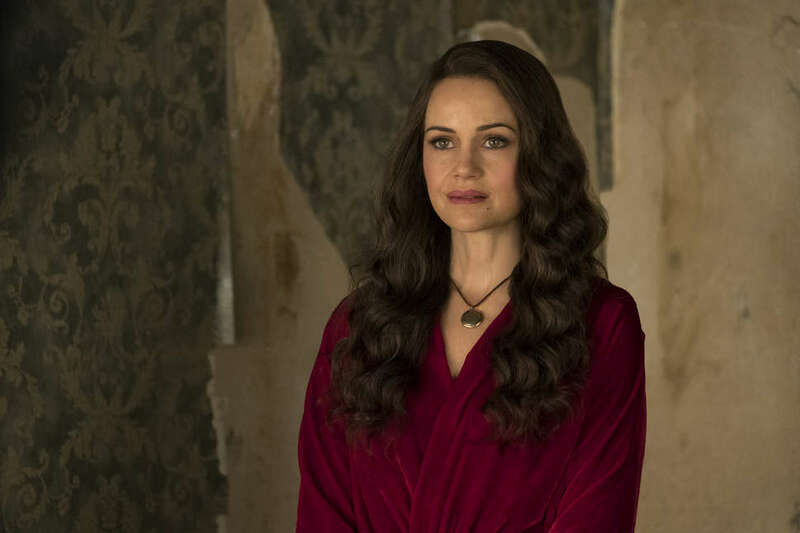 The Haunting of Hill House is a show which rewards repeat viewings. The more you watch, the more you'll notice the little hidden details, like the strange vertical window in Nell's toy room, Luke's treehouse, Theo's dance studio, Shirley's family room, Steven's game room, and Olivia's reading room -- your tip-off that these are all the same room. Or callbacks to Shirley Jackson's novel and its 1963 film adaptation, The Haunting. (Recognize Nell's therapist, Dr. Montague? That's actor Russ Tamblyn, who played Luke in The Haunting.) There's even an item from E.T., which starred The Haunting of Hill House cast member Henry Thomas. Some of that is just window dressing, but some will help you sort out the series' slipstream of the past and present. To help those who have watched the show at least once through and are still confused, we asked showrunner Mike Flanagan to explain the final episode and answer other lingering questions. The whole series has an interlocking structure -- it's almost like the architecture of the house, in a way. Yeah. This was a crazy, crazy structure. In the writers' room, we had whiteboards surrounding us, kind of on each wall, and I remember before we put it on the page, when we were just working on the basic structure of the series, our basic episode arcs, it looked like madness. It was just all these lines drawn between story points across episodes, and it kind of looked like those scenes in the movies where someone's tracking a serial killer or a conspiracy theory, and it's all red string and push-pins. And that was one of the more exciting things about this whole thing, to be able to play with a structure like that. We thought very much about the binge-watching experience, and how people tend to do two or three episodes at a time, so that was kind of neat, because then each little chunk was like a movie. So yeah, this was designed for binging. And we didn't have to worry about losing our momentum by spacing out the episodes or dealing with commercial interruptions, which would have killed the show. Seeding clues was some of the most fun we had. The big ones we knew before we wrote even the pilot, like the Red Room twist and the Bent Neck Lady twist, which was one of the biggest hooks for the pitch for the show. We figured we had three big reveals to parse out, and the midpoint made the most sense for the Bent Neck Lady, because it gave us enough runway to kind of create assumptions, and it gave us a lot to look back on and recontextualize. Throughout those first five episodes, we're trying our best to leave little breadcrumbs for what episodes nine and ten will be. And that's really tough to do in a structure this large. Ten hours is a long time. We all kind of twisted ourselves into knots! So how did Hill House get haunted in the first place? We had a whole history of Hill House that we were going to shoot. We were going to open several episodes of the show with this kind of history, split out over the whole season, which would show you the construction of Hill House, the history of the Hill family, who everybody was. And we really wanted to shoot it. We wrote it all up, and it was scheduled to shoot. And it was just one of those things where we were running out of time and resources, and something had to go. That's the one thing I wish we had gotten to do, kind of visually watch Hill House come to life and learn more about the ghosts. Learn who they were before we encountered them as ghosts. But there's also something nice, at the end of the day, about not knowing. That there's some ambiguity there, too. At the end of the series, we get a scene that suggests a peaceful ending. It reveals that Steven's wife is pregnant. But wasn't that a clue earlier in the episode that what Steven was seeing wasn’t real? Should we trust the ending? What about the Dudleys? And the promise that Steven inherited, to keep the house and keep others away from the house? In Episode 7, Mr. Dudley gives a great monologue when he tells the story of their first daughter. Mrs. Dudley was working in the house throughout her whole pregnancy, and as she got closer to giving birth, her employer Hazel Hill wouldn't let her leave the house. So the baby was stillborn. And they would hear it crying whenever they were in the house, which is why they wouldn't stay after dark. So I see the ending as a reunion for them, where Mrs. Dudley is able to be with both of her children, who the house had already taken. Since Abigail was a real child, not Luke's imaginary friend. Yes. Because their first child was stillborn, their second child was very sheltered. I think the Dudleys talked an awful lot about how they don't trust schools, and society, and they basically kept this kid locked up and forbidden from going to Hill House. And of course she's getting to the age where she wants to go anyway. So whenever we've seen Abigail in the woods, or Luke talked about seeing her, or even Nell says that she's seen her, that was really just a curious little girl coming over to look at the house. Luke was off playing by himself, away from the house, on the grounds, and I think that's where Luke and Abigail would have spent most of their time together, before the tea party. And everybody was just too consumed with their own stuff to notice her. So we, as an audience, think she's a ghost. But she doesn't become a ghost until the very end. Some objects in Hill House seem to connect to your previous work. Do they exist in the same universe? Ah, you probably spotted the Oculus mirror! [Laughs] I always love to do that stuff. In my head, all of these things take place in the same world, and so that's really fun for me to try to sneak anything in. We kind of ruin the illusion a bit because I like to use the same cast over and over. But yeah, I think fans of Oculus will definitely find stuff to spot. And in general, fans of other movies I did prior to this will see at least one familiar cast member. That was fun. Do you mean as one of the ghosts? Yes! If you do watch it again, keep an eye on the background. We hid somewhere between eight to 12 ghosts in every episode. We never call any attention to them. But they're there, in a doorway, or under the piano, or under a table, or behind a curtain. We were throwing ghosts all over the show, trying not to be noticed. And I think it worked, because I haven't heard anyone talking about them. It's a fun little Easter egg for the second viewing.